Yusuf Umar Found $100,000 And Returned It To The Owner! You find money that can change your lifetime in foreign currency but instead of taking it, you return it to its rightful owner..A good name is better than all the riches in the world....you agree even in these hard times? His name does not ring a bell and he is not the type that seeks public attention. 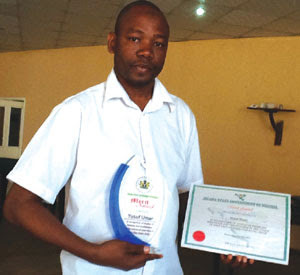 But Yusuf Umar, 38, and Chief Receptionist with Jigawa Hotels, is now a celebrity and cynosure of all eyes because of what he did in June this year, lifting the name of the hotel and his family from obscurity to limelight. On June 27, 2014, Umar, while working in the Jigawa three-star hotel, saw something he had never seen in his life. He was working round the hotel garden around 1am when he came across an Ipad pouch that a guest, who lodged in the hotel and left earlier that day, had forgotten as he was leaving the lodge. Out of curiosity, the Dutse-born hotelier picked the small bag and opened it. What he saw shocked him and he quickly went away with the bag to his duty post. He did not tell anyone but his manager. Inside the small bag were crisp $100,000 notes neatly packed in rows that would have made the man an instant millionaire in Nigeria. At the current exchange rate of N170 to a dollar, the money translates to N17 million and would have been enough to change the social and economic status of Umar, an orphan, who was brought up by his uncle, Kadi Umar, who resides with him at Garu Quarters, Emir s palace in Dutse. Although Umar saw the money in the jacket, he never counted it, he presented it as it was to the manager of the hotel to keep. But it was not long before the man, who forgot the money discovered that he had misplaced the money and the Ipad bag. He rang the hotel, fearing that his worst moment had come. What would he do if the money was not found and who was he going to report to given the fact that there was no evidence that he even came to the hotel with such amount of money? Many troubling thoughts continued to ravage his mind and he could not sum up courage to come back to the hotel or call the staff to inquire about the missing money. However, the woman, who booked the lodge for him, rang the hotel and reported the loss of the money to the Head Receptionist, who happened to be Umar, whom she had known at the point of booking the place for the man. ’’Hajia, the bag is with me’’, Umar answered when the lady called. I don’t know exactly how much is in the small bag but it is neatly packed inside the bag, In a jiffy, the woman landed at the three- star hotel and was handed the bag containing the money by Umar. She could not believe it was real. She almost fainted after counting the money and realizing it was complete. Not a single note was missing from each of the ten packs of $10,000. She disappeared in ecstasy and returned in a short while clutching two envelopes, one containing some money for Umar in appreciation for his honesty and the other for the hotel management for being exceptionally transparent in dealing with its clients. The singular act by Umar has continued to reverberate two months after the money had been found and returned to the owner. But Umar himself, an Ordinary National Diploma Student at the Jigawa State Polytechnic, who lost both parents at a tender age and joined the JHL at inception in 1999, is enjoying the fame and positive publicity he is getting daily. Like a good product, he is being sought after by visitors to the hotel and top government officials, who have heard about him. Some regularly come around to shake hands with him while others drop by to give him some gratis all in a bid to identify with one-of-a kind Nigerian, who has lifted the name of Jigawa State to the international limelight. ’’I could not have taken the money because it was not mine’’, Umar told Sunday Vanguard at Dutse, adding that he was taught by his parents not take what does not belong to him so as to prosper in life. He said he was not also tempted to disappear with the huge sum because as far as he was concerned, his conscience had already told him that the money did not belong to him, and that he should quickly present it to the owner in line with his religious values of speaking the truth no matter how difficult the situation may be. According to Umar, three factors influence his decision not to keep the money. First, as soon as he took it, he remembered his God that it would be an offence to take what does not belong to him; second, he remembered his father’s injunction not to take what does not belong to him if he wanted to prosper in life and; finally, the fact that it is a policy of the hotel management not to tamper with any item left behind by any guest. There is a tradition in the hotel that even if a guest forgets an item or money it should be kept for him in a strong room that now accommodates undisclosed large amount of cash and valuables as a demonstration of its commitment to honesty and integrity. Umar said a man, who had forgotten N200,000 came back and was given it in the same currency that he left in the hotel. The money was picked up by a cleaner while sweeping the room and returned to the management for upkeep until the owner showed up two years later with evidence of lodging there and proof that the money was in certain denominations. Umar’s act of honesty has already attracted the attention of Governor Sule Lamido, who, at a public ceremony, last week, showered praises on him and urged him to continue to exhibit the virtue of integrity. As a reward, the governor presented Umar with a motorcycle and a plaque and a certificate personally signed by him during the 23rd anniversary of the state. It was an honour that excited Umar the most in his life. He never expected to have a handshake with the governor but the single act of honesty provided the platform and lifted his family name beyond Dutse. Before the governor honoured him publicly at the Mallam Aminu Kano Triangle on Wednesday, Umar was blessed on Monday with a bouncing baby boy by his wife, increasing his family members to two. He already had a boy. I really value the certificate and plaque given to me by the governor more than the motorcycle because the gesture means that I am known within and outside Nigeria. I am really really excited about that, Umar said. For that reason, Umar has decided to change his course of study so as to give the opportunity to become a diplomat one day. I want to go into the Foreign Affairs Service so that one day I can work as a diplomat and make my country proud, the father of two said.